The polar cap of Sputnik Planum, in false colours, is surrounded by mountains which have been eroded and shaped by the glacial activity. The dark areas are covered by organic materials produced by the photolysis of methane by solar ultraviolet light. Image credit: © NASA/Johns Hopkins University Applied Physics Laboratory/Southwest Research Institute. What is the origin of the large heart-shaped nitrogen glacier on Pluto revealed by NASA’s New Horizons spacecraft in 2015? Two researchers from the Laboratoire de météorologie dynamique (CNRS/École polytechnique/UPMC/ENS Paris) show that Pluto’s peculiar insolation and atmosphere favour nitrogen condensation near the equator, in the lower altitude regions, leading to an accumulation of ice at the bottom of Sputnik Planum, a vast topographic basin. 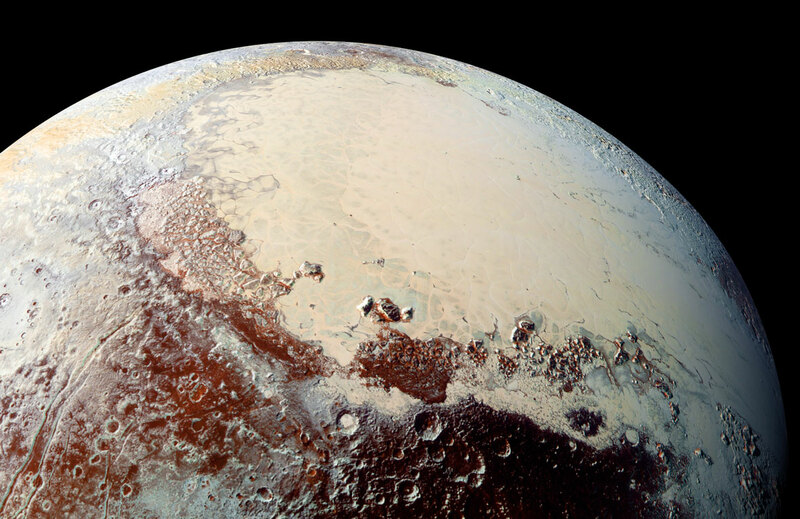 Through their simulations, they also explain the surface distribution and atmospheric abundance of other types of volatiles observed on Pluto. These results were just published in Nature. Pluto is a paradise for glaciologists. Among the types of ice covering its surface, nitrogen is the most volatile: when it sublimes (at -235 °C), it forms a thin atmosphere in equilibrium with the ice reservoir at the surface. One of the most unexpected observations from New Horizons, which flew by Pluto in July 2015, showed that this reservoir of solid nitrogen is extremely massive, and mostly contained in “Sputnik Planum”, a topographic basin located within the tropics of Pluto. Methane frost also appears all over the northern hemisphere, except at the equator, while carbon monoxide ice in smaller amounts was only detected in Sputnik Planum. Until now, the distribution of Pluto’s ice remained unexplained. 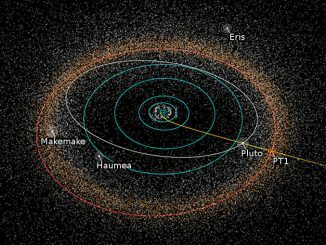 To better understand the physical processes at work on Pluto, the researchers developed a numerical thermal model of the surface of the dwarf planet able to simulate the nitrogen, methane and carbon monoxide cycles over thousands of years, and compared the results with the observations made by NASA’s New Horizons spacecraft. 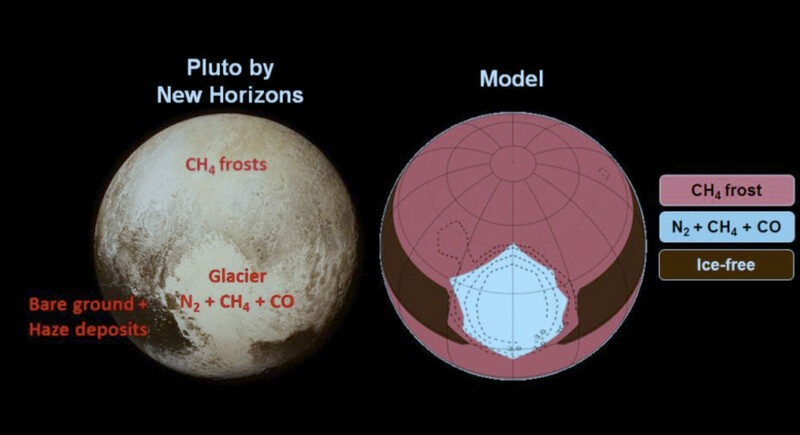 Their model shows that the solid-gas equilibrium of nitrogen is responsible for trapping the ice in Sputnik Planum. At the bottom of the basin, the pressure of the atmosphere — and therefore of gaseous nitrogen — increases, and the corresponding frost temperature is higher than outside the basin, which allows the nitrogen to preferably condense into ice. Simulations show that the nitrogen ice inevitably accumulates in the basin, thus forming a permanent nitrogen reservoir, as observed by New Horizons. 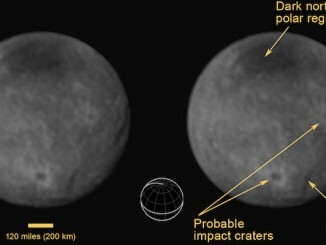 Pluto as observed by NASA’s New Horizons spacecraft in July 2015 (left), compared to the model result to date (right). Image credit: © Laboratoire de météorologie dynamique (CNRS/École polytechnique/UPMC/ENS Paris) / NASA/Johns Hopkins University Applied Physics Laboratory/Southwest Research Institute. 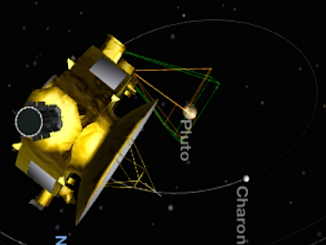 A speedy space probe barreled past Pluto for a one-shot flyby Tuesday, becoming the first spacecraft to ever visit the frozen, reddish world at the solar system’s distant frontier. The first hints of dramatic cliffs, chasms and craters are showing up in new imagery of Pluto and its Texas-sized moon Charon as NASA’s New Horizons spacecraft prepares to bolt by the icy worlds Tuesday.